When does registration close? Online registration closes on Wednesday, December 12 at Noon, but in-person registration will be available at early packet pick-up (see dates/times below) and on event day. Do participants get finisher medals? Yes! 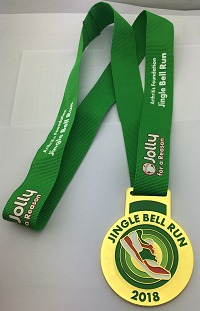 In addition to getting long sleeved, holiday themed t-shirts, all participants will receive finisher medals as they cross the finish line. When: Friday, December 14, 2018 from 2:00 - 5:30 p.m. When: Saturday, December 15, 2018 (Event Day) at 7:30 a.m.
We strongly encourage participants to alleviate race-day congestion by picking up race packets early. It is OK to pick up shirts and packets for others and, in fact, we strongly encourage it.